This year, rather than a list of resolutions (and believe me, I have many), I thought I would tally the reading/writing things I’ve managed to accomplish. Some of them represent the fulfillment of last year’s resolutions (Book Three has been revised without undue emotional distress! The dratted play has been finished, and titled! ), some waver in that scribbly gray place between success and failure, and some have nothing to do with resolutions at all. Here goes. MY NEW ORLEANS – Rosemary James, ed. ROALD DAHL’S BOOK OF GHOST STORIES – Roald Dahl, ed. FEET ON THE STREET: RAMBLES AROUND NEW ORLEANS – Roy Blount Jr.
WHERE ONE VOICE ENDS, ANOTHER BEGINS: 150 YEARS OF MINNESOTA POETRY – Robert Hedin, ed. THE 2011 RHYSLING ANTHOLOGY – David Lunde, ed. TROLL’S EYE VIEW – Ellen Datlow and Terri Windling, eds. The two books that made the strongest impact on me–that ended up being the sort of book I wanted to gift wrap and force into the hands of everyone I know–were Gillian Flynn’s DARK PLACES and Susan Jacoby’s FREETHINKERS. I can’t say enough about DARK PLACES; the voice, the characterization, the atmosphere, and the plotting are all pitch-perfect. It’s brutally beautiful and beautifully brutal. FREETHINKERS was fascinating, simultaneously frightening and encouraging, and full of incredibly important things to keep in mind as the U.S. continues to redefine its identity. There. That’s what I got done this year. I wish everyone a 2012 full of adventures and discovery and joy. 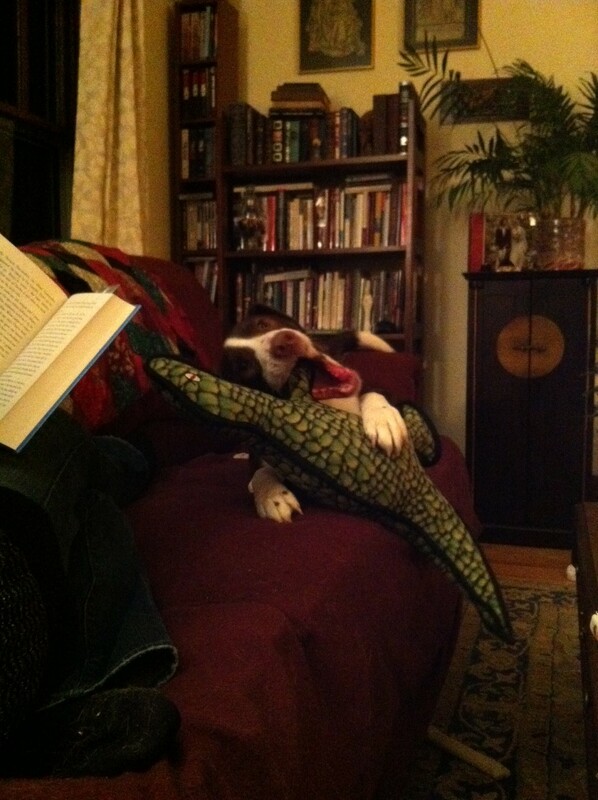 And speaking of joy, here is Brom Bones, enjoying his largest Christmas present. Brom is battling his ‘indestructible’ Godzilla chew-toy. Godzilla has already lost one foot and the tip of his tail. Thanks for the birthday and holiday wishes! — Both were wonderful! Happy New Year, Jacqueline! Looks like you pretty much read tripple of what I did (even if I did read many, MANY books in 2011). It was your birthday recently? In that case, HAPPY BIRTHDAY! (It was mine just a few days ago, too.) And happy New Year. Here’s to a fearless, productive (hopefully) 2012! Looking forward to both your Top-Secret Announcement and the new Elsewhere book. Yes, I tend to read as though a dragon will eat all of the world’s books tomorrow: desperately, in a gluttonous panic. A happy New Year and happy birthday to you, too! I hope your next year is full of triumphs and magic and discoveries.